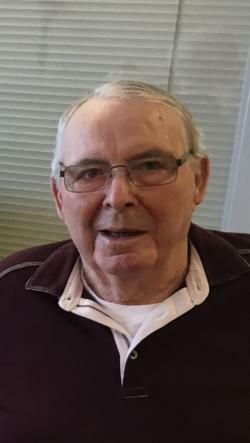 Belliveau, Simon Louis, age 90 of Nakile Home for Special Care, Argyle formerly of Lower West Pubnico, died Wednesday, March 20, 2019 in the home. Born in Lower West Pubnico he was a son of the late Anthony and Margaret (Morris) Belliveau. Simon was a retired fishing industry maintenance man. He is survived by a son Brian (Jody), Yarmouth, daughters; Darlene Belliveau, (Bruce) Barrington, Joan Belliveau (Gordie Whalen) Moncton, NB and Simone (Clark) Donaldson, Argyle, a sister, Sophie Bourque, Yarmouth, grandchildren; Maria, Shawn, Brett, Daniel and Robert and a great granddaughter Chloe. He was predeceased by his wife Marie Thérèse (Muise), brothers; Oliver and William and a sister Eugenie. Visitation will be in the West Pubnico Funeral Home, Middle West Pubnico on Friday, March 22, 2019 from 7-9pm and Saturday from 9-9:30am. A Mass of Christian burial will be held at 10am on Saturday in St. Peter’s Roman Catholic Church, Middle West Pubnico with Fr. Cyrille Assihou officiating. Interment will be in the parish cemetery. Memorial donations may be made to St. Peter’s Roman Catholic Church or a charity of choice. On line condolences may be forwarded to the family at westpubnicofh.com. Funeral arrangements have been entrusted to the West Pubnico Funeral Home and Cremation Services, Middle West Pubnico. 902 762-3407. Simon took pride in his work as a loyal employee at Inshore Fisheries Ltd for 63 years. He was an active member of the West Pubnico Legion, Branch 66 and was well known for organizing "Les dances à Simon" as he had a passion for dance. He was known for his kind heart, great sense of humour, but most of all he loved his family and friends.